Will Dyson was born near Ballarat, and began his only art training in 1896, drawing with George Coates. He began contributing to the Bulletin in 1897, his first cartoon in a distinguished career of black and white illustration. In 1909 he married artist Ruby Lind, both of them leaving shortly after for London with Ruby's brother Norman Lindsay, where Dyson achieved considerable fame as chief cartoonist for the London 'Daily Herald'. In 1916 he was appointed an official War Artist for Australia, in France. 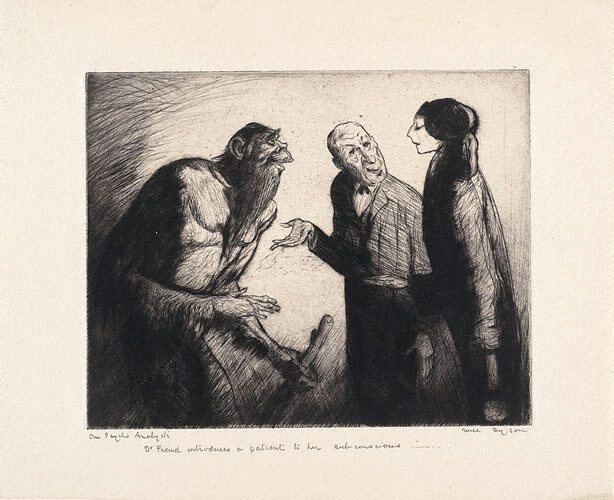 From these experiences he produced a book 'Australians at war' in 1918 and a series of 32 lithographs of subjects from the front are in the Gallery's collection. His work suffered following Ruby's death from influenza in 1919, and in 1925 he accepted an offer from Melbourne Punch to return to Australia. He started making drypoints upon his arrival in Melbourne with the help of Cyril Dillon, a friend from Dyson's early days in the Savage Club, and printed them on a converted mangle. He left Australia in 1930 for London via New York. Upon his arrival in New York he exhibited 39 drypoints at the apartment of Hartley Grattan, a writer, in 1931. 'Our psychoanalysts; Dr Freud introduces a patient to her subconscious...' and 'Naughty, naughty, who's been thinking pure thoughts again' were included. The show was a great success. He exhibited his drypoints again successfully, in November 1930 at St George's Gallery, London. He continued to make prints until his death in 1938. This is one of four satirical drypoints by Dyson in the collection. Signed l.r., pencil "Will Dyson". Not dated.